Fishing on the K is red hot right now. Look for the Hendrickson hatch mid-afternoon and spend the rest of the day fishing for sippers! Fish a CDC wing emerger dropped 24" behind a visible dry fly. It is nearly impossible to see a CDC emerger fished in the film, so use the dry fly up front as your indicator. Your emerger will out fish the dry 10 to 1. Don't be afraid to ignore the hatch and strip streamers to to risers either. The water temp was 52 degrees yesterday, so fish metabolisms are in high gear. They are acting like a bus load of teenagers who just hit the buffet line at a Golden Corral. Often times a streamer stripped through the feeding window of a rising fish will get a take. 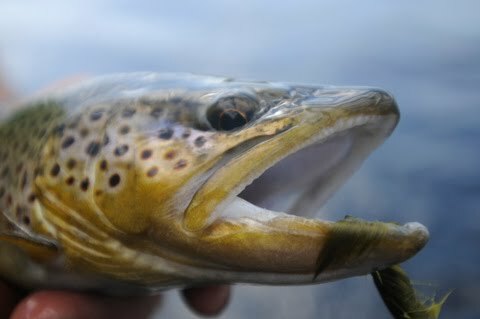 This is a shot of a sculpin eating Kennebec brown taken by our buddy Andy Molloy on a float earlier this week.